Bitcoins are making their way, in Bits and Pieces. In a recent report The Hacker News (THN) had mentioned about banks adopting the Blockchain Technology from Bitcoins; to create a safe and secure distributed ledger. 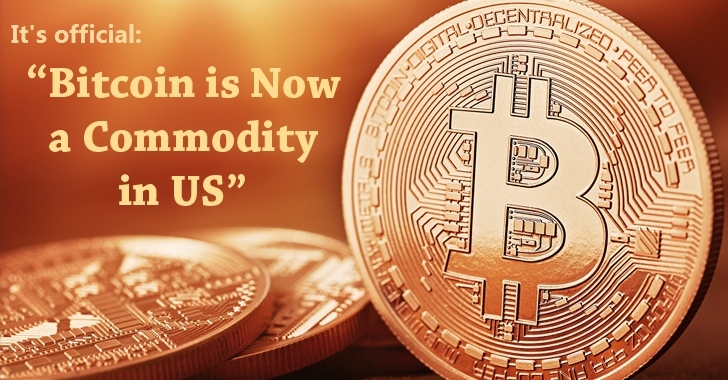 Now, last week U.S. Commodity Future Trading Commission (CFTC), has added Bitcoins and other virtual currencies to the commodities basket which previously includes Gold, Crude Oil, foreign exchange, and Stocks. CFTC is an oversight committee of the USA, established to protect the interest of the people who have invested in any of the commodities by ensuring the conduct of no malpractices. The commodity swaps are working according to the Commodity Exchange Act (CEA). Implying which now the Bitcoins and other virtual currencies, considered as cryptocurrency earlier, are now known as commodities for the conduct of trade. Moreover, after being tagged as a commodity and making its entry into CEA by CFTC, Bitcoins made it obvious that they are not having any five-year plans to do so rather they have already done it. Moreover, it is now compulsory for every Bitcoin holder to comply with the CEA, and if not, then CFTC would take strict actions against them. Considering a scenario, by comparing stolen money and stolen Bitcoin (post becoming a commodity), when stolen cash is reused nobody asks the owner of the cash any question but when a stolen product (commodity) like gold or Bitcoin brought for a reuse, that definitely is followed by a series of question. Going back to the risks associated with the Bitcoin as a virtual currency, where the World's Largest Bitcoin Exchange Mt. Gox had to shut down its services because of stealing of Bitcoins. Therefore, Bitcoins being a commodity will ensure its authorized and smooth swapping. You can follow CFTC's official report to get an in-depth explanation.